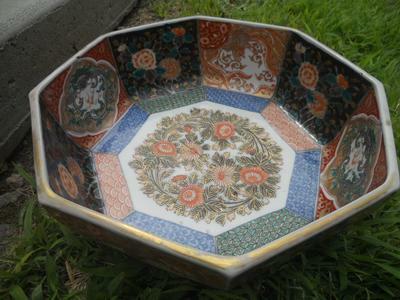 Have spent lots of time looking at Imari on the internet but can't seem to figure out what time period or style this bowl is. it is approx. 10-1/4" in it's octagonal diameter an about 4" deep. I'd appreciate any info if you can help and/or at least point me in a direction I haven't already gone trying to learn more about it. Also, are the markings on the base recognizable, do they mean something or do they tell who made it? Thanks! Design and shape look Japanese. The mark says it was made during the (Chinese) Chenghua Reign of the Ming Dynasty, but this is apocryphal. 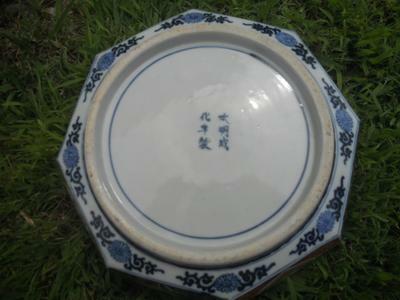 Such marks frequently appear on older Japanese porcelain. 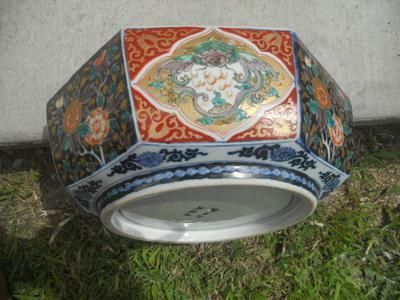 Not sure, but could this be Arita porcelain?